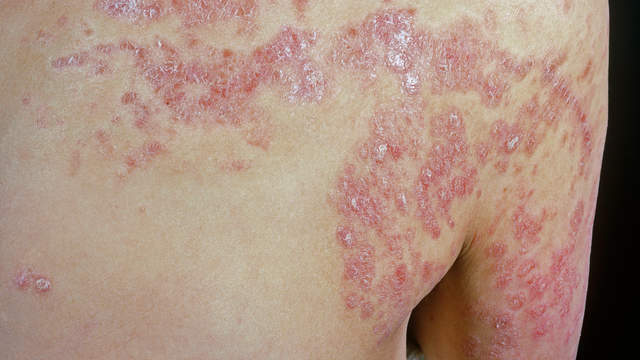 Psoriasis happens to be one of the most baffling skin disorders that can often be an unpredictable and irritating health issue for a patient to manage. It is caused due to an overactive immune system whereby skin cells tend to multiply many times faster than normal. As these additional cells reach the surface of a patient’s skin and die, their increased volume causes red plaques covered with white, flaky scales to appear which happens to be one of the most common psoriasis symptoms. These plaques usually appear on a patient’s knees, elbows, scalp, knees, torso and even the soles of their feet. These red patches tend to be irritating and itchy and can totally ruin the physical appearance of a patient. Discoloration and pitting of nails is another common symptom that is known to occur with psoriasis and the patches on a patient’s scalp usually appear like a bad case of dandruff. While there is no specific way to cure the condition yet, there are many ways available in which a patient can reduce the appearance and severity of symptoms cropping up on their body. Psoriasis treatments in India cover a wide range of therapies including occlusion, steroid creams, light therapy and oral medications. Biologics are an emerging treatment modality for psoriasis which, although expensive, is known to offer much needed and longer lasting relief to patients who are dealing with this condition. If you are seeking psoriasis treatment in Mumbai, be sure to visit RinkyKapoor.com for a consultation.